The geometric tortoise is found in the Kalahari Desert and Cape Province of South Africa, and it is one of the rarest tortoise species in the world. It has a very strong, black and yellow patternered carapace used for defense against predators. The patterns are arranged in ray-like markings and help the tortoise blend in with its environment. 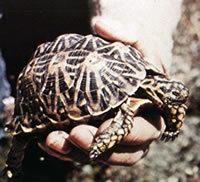 This tortoise is very small, and a full grown turtle can only reach about 5 to 6 inches in diameter. The geometric tortoise's diet consists mainly of leaves, flowers, and grass. They are said to hibernate in the months of June thru September or when their natural environment is not normal or when in captivity. Little is known about their reproductive behavior. When the female is ready to lay eggs, she digs a hole in the ground and covers it with grass or other vegetation. The geometric tortoise has lost 97% of its habitat, and only 2000 to 3000 individuals exist today. It is threatened for a number of reasons including loss of habitat. Its eggs are a source of food for the African people and traders capture the adults for their shells which are used to make many different decorative items. 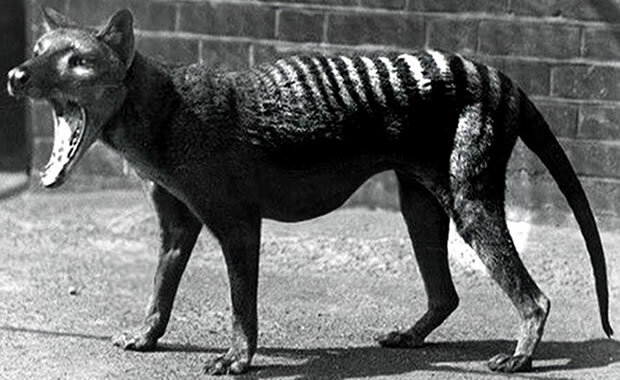 This species is also preyed upon by other mammals. The South African government has set aside restricted park lands for the geometric tortoise and there are laws that prohibit the capture and the taking of it's eggs. Copyright Notice: This article is licensed under the GNU Free Documentation License. It uses material from the Wikipedia article "Geometric tortoise". Glenn, C. R. 2006. "Earth's Endangered Creatures - Geometric Tortoise Facts" (Online). Accessed 4/23/2019 at http://earthsendangered.com/profile.asp?sp=479&ID=1. Need more Geometric Tortoise facts?